The first stop for the newly-delivered Ford Mustang is Tickford Bay 1; it's here where the vehicle starts getting stripped back. 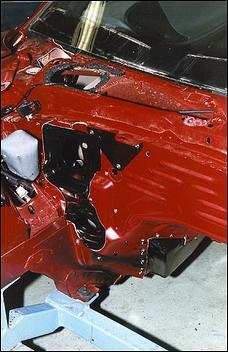 Amongst the parts removed are the bonnet, engine and trans, brake lines, steering and front wheels. Also - to enable the vehicle to be pushed to various work bays along the 50-odd metre conversion line - a castor wheel frame is bolted under the nose. 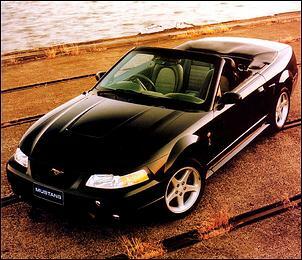 The Mustang is then moved to Bay 2, where it is stripped of its US-market interior. 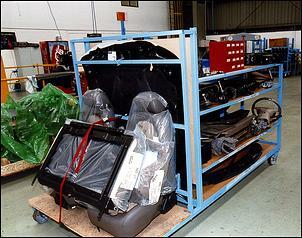 To ensure that all removed components stay with that particular vehicle, each part is placed on a trolley that's colour coded to the car's castor wheel frame. 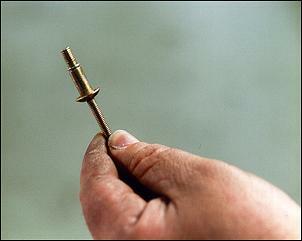 Some parts - such as the heater casing - cannot be reused and are immediately put aside. 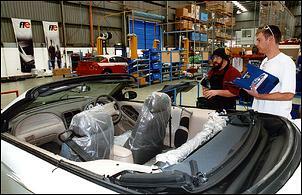 This is inside Bay 3 - where the so-called "big job" takes place. Here, various holes are carefully cut into the firewall and new 'through panels' for the new steering column, brake booster and throttle cable are installed. As we were told, this is the stage where a wrong cut can put an end to the whole conversion process... 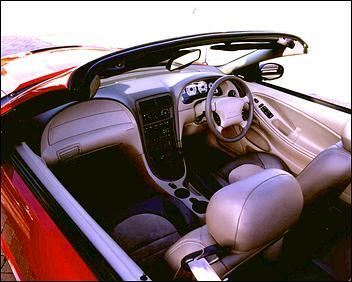 This is the view from the engine bay side. Due to the slight relocation of the engine and trans assembly (which we'll come to soon), the gearbox selector cut-out is now trimmed to suit. 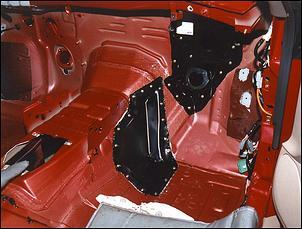 From inside the cabin you can see the black panel in the firewall (the one pictured above), along with an additional insert on the right side of the trans tunnel that creates more driver foot space and forms the footrest. Both of the new firewall and trans tunnel panels are secured to the original floor pressing using stainless steel rivets and heavy-duty mastic adhesive. Of course, the exposed metal around every new hole has a primer applied to give corrosion protection. Moving on to Bay 4, the wiring harness - which is a combination of the original loom, a modified original loom and an all-new loom - is routed throughout the vehicle. A new right-hand exterior mirror glass is fitted, along with new driver mirror controls that are sonic welded into the right-side door trim. New child restraint anchorages are also installed. Next - in Bay 5 - comes the fitment of a new accelerator pedal (to the original pedal box) and the brake booster is refitted to the vehicle (at a 23-degree angle in order to improve under-bonnet packaging). 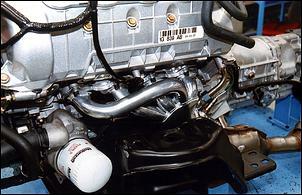 The master cylinder is also bolted in together with the booster. 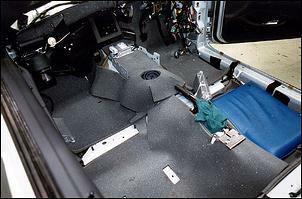 A comprehensive sound-deadening package is then installed, comprising a triple-layer foam floor cover and unique foam blocks that are inserted into the base of the A-pillar. These blocks are said to insulate the noise that travels up the hollow A-pillars. In Bay 6, the whole of the original interior - except for the LHD dash - is reinstalled along with a new heater box. The heater box is built using the original core (slightly modified), fan and actuators. New wiper arms are also fitted to suit the relocated driving location. 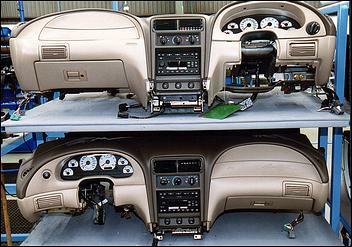 Here you can see the original US dash compared to the Australian dash. To ensure build quality and consistency, the Australian dash comes from the same manufacturing plant and is designed to mirror the original dash as much as possible. Subtle variations for the Aussie version include some slightly different proportions and an AU Falcon headlight switch replacing the US push/pull style device. It isn't just a matter of stuffing in the new dash panel, however. Here is the made-from-scratch (on a jig) dash skeleton that's needed to support the assembly and fit around the RHD steering column etcetera. It's a very intricate design that requires a great deal of patience to get right. Bay 7 sees the Tickford people reinstall the Mustang's 4.6-litre V8 engine, gearbox and tailshaft (all done from beneath). The original brakes are also refitted, along with a new steering rack and column. 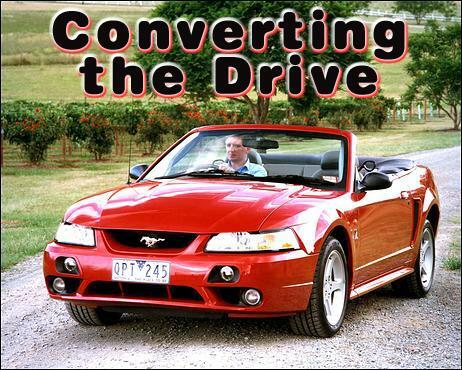 Everything is torque'd to spec during the entire conversion process. 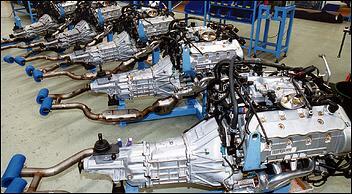 Note that - to gain necessary component clearance - Tickford relocate the engine and transmission assembly 25mm toward the centreline of the vehicle. This is done using a new cross-member, engine and gearbox mounts. 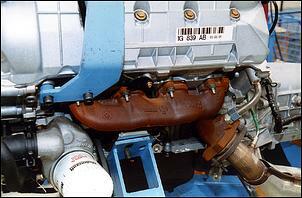 Also working in the engine bay, the air conditioning gets re-gassed and all systems are bled. 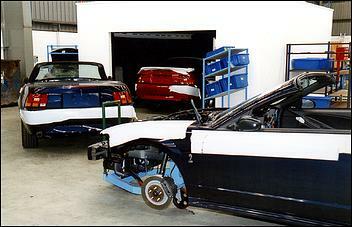 Before being reunited with the vehicle, however, each of Ford's 240kW bent eights must undergo a few RHD preparations. 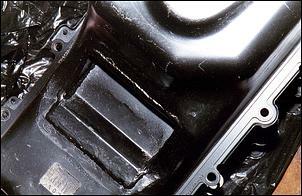 Here, you can see that a new section has been welded into the bottom of the oil sump to clear the new steering rack. Interestingly, it's also necessary to machine a small amount of material away from the rear of the right-hand cylinder head, as well as the side of the gearbox. This is to attain the desired amount of component clearance. ...and in their place are these ceramic-coated HM headers, which lead into the original Mustang pipes and cat converters. 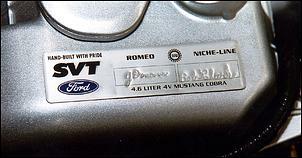 Oh, and one distinguishing touch of the Mustang is the name of the employees who built the engine are scribed into the 'hand built with pride' valve cover plate. The final work bay - Bay 8 - sees the original bonnet go back on, together with a pair of unique-to-Australia headlights and supplementary bumper lights. The Australian-spec main headlights incorporate revised reflectors, while the supplementary bumper lights are used to serve as parkers (aka side markers) and 'boosters' to high beam. To accommodate these lights, holes are cut into the poly-based bumper, while the crash bar behind also receives some mods to accommodate their depth. 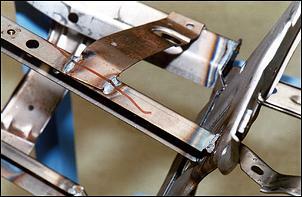 A template is used to heat, bend and cut the crash bar as required. Following this, various decals are stuck on where necessary and the new owner's manual goes in. With conversion work now competed - which typically takes around 55 hours of work and 7 days from start to finish - the vehicle moves on to the test bay at the opposite end of the Tickford facility. 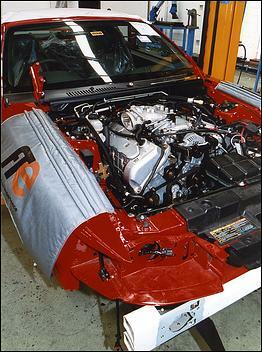 Here, a quality audit is performed, the Mustang's security system 'data dots' are sprayed under the body, a wheel alignment is performed and the driveline is balanced. 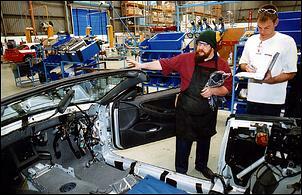 The last step is a road test, and - with everything passed - is then sent onto Ford dealers around the country.